Jonathan had absolutely no use for "tummy time" until a little over a month ago, when he saw his buddy, Sage, crawling. He watched her in total awe and wonder. Since then he has been on an awfully tenacious mission to master the crawl. We're so happy for his growth and development... but it has it's drawbacks. Now he falls. A lot. 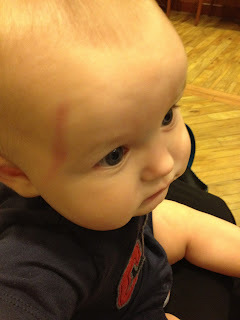 His crawl mission started with a face-first launch onto the floor from a sitting position. We have a tile floor, but we were pretty good at keeping him on the rug so the damage from such sudden launches was minimal. His first big fall was, as luck would have it, on Mother's Day. Happy first Mother's Day, Katie! Each morning he sits on the bed and watches me do my hair. That Sunday was no different. Fabio was still asleep in the middle of the bed, and Jonathan sat by his side happily playing. I turned around to check the back of my hair and heard a "CRACK!" followed by a split second of silence while I whipped around and then a heart-wrenching cry. Sure enough, he had managed to launch himself completely off the bed in his attempt to crawl. I snatched him up, held him close, showered him with kisses, but he still cried (and so did I). We gave him tylenol, he still cried. Fabio took him in his great big hands, read him his favorite book, and he started to calm down. I asked Google, "Should I go to the doctor when my baby falls off the bed?" She said probably not, but after talking to Fabio we decided that we would both feel a lot better and a lot less like the horrible parents we felt like at the time if we took him to get checked. A lot of benefit for the $40 clinic fee. So we called our friends to take our church assignments for us, and headed to the 24-hour clinic. The nurses were so sympathetic and sweet. When the doctor first picked up J, he snatched the man's stethoscope, grabbed for his glasses, and launched forward in another crawl attempt. The doctor smiled and said, "If he's that curious and playful, I think he's fine." But he still did a very thorough check and confirmed his original hunch, then urged us to "be more careful." Well, it's a good thing he said that, because I wasn't feeling horrible enough before and I probably wasn't going to behave any differently. Sheesh! I know, I know... what else can he really say, but still! The poor little fella had quite the mark to show for the ordeal. The clinic waiting room at 9 am on Sunday morning. Sure enough, the next day was his monthly check up, so I had to explain the whole thing to his pediatrician who double-checked him (which I appreciated) and then looked at me and said, "Well you need to be more careful." Sigh. Anyway, it was an eventful start to Jonathan's new-found mobility. I did, in fact, learn to be more careful. We bought a bedrail, I cleaned out the store by our house of all their baby floor pads, and started using the "big boy" stroller. But that hasn't slowed down the steady flow of "bonks" that seem to rain down on our house. He is so active and so wiggly... and he learns something new every day (some days it feels like every hour). Last week he was playing in his crib while I cleaned up his room when he pulled himself up, looked over the edge at the long drop, then looked at me with a sparkle in his eye and a big smile as if to say, "Ooo... that looks dangerous." I picked him up, put him on the floor, and told Fabio to move down the crib mattress. Before I was pregnant a woman told me about her now-adult son who, when he was two years old, she found hanging with both hands from one of the living room's ceiling fan paddles as it slowly rotated, with a big smile on his face. To this day, she has no idea how he got there. I keep telling myself that if he managed to make it to adulthood and finish college, then maybe my death-wish baby will too. Ha ha--mine have entered the "destructively curious" age at different ages in their lives, but this too shall pass :). Maybe he'll learn--and maybe not, but if he doesn't, you sure will! :) Don't feel badly--it's hard to watch them EVERY SINGLE SECOND.